Owned and managed by Historic Scotland, Huntly Castle is a magnificent ruined 12th Century castle which still commands a sense of awe and is well worth a visit. Huntly Castle took several centuries to construct and was used as a Baronial residence for five centuries. Initial construction commenced in 1240 by Earl Duncan and was given the name of The Peel of Strathbogie. It remained in the Strathbogie family until 1314. The Strathbogie family gave shelter to King Robert the Bruce after falling ill at Inverurie. Upon his recovery he went on to triumph at Bannockburn. However the new Lord, David of Strathbogie turned against King Robert prior to the battle and as a punishment his lands was forfeited. In 1314 King Robert granted the surrounding land to Sir Adam Gordon of Huntly and the building name was changed to Huntly Castle and became the seat of the Gordon Clan. The Gordon's retained ownership and in 1408 the last male heir, Sir John Gordon, was succeeded by his sister Elizabeth. She married Sir Alexander Seton later that year. A stone tower was constructed in 1408. Elizabeth and Alexander's son, also called Alexander, was made first Earl of Huntly in 1449, and the Castle stayed in the family since. Through the following years it saw attack after attack and new buildings added and reconstructed. 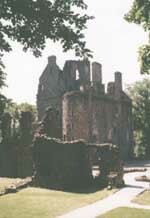 During the Reformation the Castle became the Scottish Headquarters of the Roman Catholic Church due to the Earl of Huntley's strong faith and support. In 1562 The Earl died in battle against the army of Mary Queen of Scots. His two sons were captured and his younger son, Sir John, was beheaded in Aberdeen. The Castle was looted and wrecked. A rebuild took place and in 1599 the new Earl was made The First Marquis of Huntly by King James and further work was undertaken at the Castle. During the Civil War the Second Marquis was executed and in 1640 the Castle became occupied by the Covenanters' army. Ownership past onto the Duke of Montrose in 1644 until it was occupied by Government troops during the Jacobite Rising. Thereafter the Castle fell into ruin and the area was used as a quarry until 1923 when the Duke of Richmond and Gordon entrusted the Castle to State care. Entrance to the Castle is by the gift shop. There is no timed entry or any need to wait for guides. It's a pleasant area to stroll around, ideally with a guidebook from the shop, and enjoy the surviving architecture, inscribed stone friezes and buildings. The 16th and 17th Century Palace Block. Several surviving fireplaces, including one beautifully rendered with heraldic mason work. Some areas within the Castle and grounds are wheelchair accessible. There is a large car park just before the Castle. Next to the car park is a picnic area and playing fields and a play area with swings, chutes, climbing frames, etc. Toilets are located next to the car park. Take the A96 from Aberdeen.